There is no word in our language which will grip the listener’s attention quicker, than the word, gold. No story is more likely to arouse the spirit of adventure than an authentic report of the discovery of new and exceptionally rich goldfields. A reminiscence of the early stages of the Nome Gold Rush (1899-1909) written by a mining engineer with fascinating and sometimes tragic details about his voyage to Alaska, wildlife, native Americans, traveling along the wild rivers, and the raw and curious world inhabited by miners hoping to strike it rich. TREVE M. GIBSON. 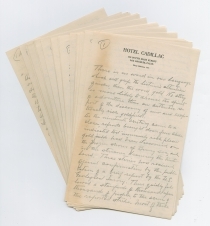 Autograph Manuscript, c. 1915, on Hotel Cadillac (Los Angeles, CA) stationery, 59 pp. 6 x 9½ in. With six Phoenix Consolidated Mining Co. stock certificates issued to Gibson in October and November 1896 for a total of 24,000 shares. 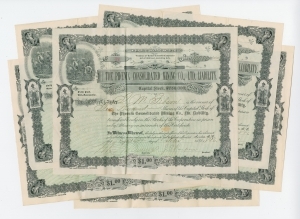 Four are signed by President and lumberman James E. Poupore; two are signed by Vice President and broker Charles D. Rand; and all six are signed by Secretary and physician Milton W. Bruner, all of British Columbia. Also with a later 57-page typescript that includes more detail of Gibson’s mining career, c. 1956. A revised version of the story presented in the manuscript appears on pages 9 to 25 of the typescript. Between 1897 and 1899, an estimated 100,000 prospectors traveled to the Klondike region of the Yukon territory in northwestern Canada, near the border with Alaska. Most prospectors traveled by water to Skagway, Alaska, moved over the Chilkoot or White Pass trails, and floated down the Yukon River. At the confluence of the Klondike and Yukon Rivers, the boom town of Dawson City grew from 500 to 30,000 people in two years to supply the prospectors. In the summer of 1899, prospectors discovered gold near Nome in western Alaska, and many of the miners in the Yukon moved to the new goldfields. During this later phase of the Alaska Gold Rush, from 1899 to 1909, prospectors initially found gold lying on the beach at Nome. Then they dug on the beaches and then at points farther from the shore, where prehistoric beaches had been covered by sand and gravel deposits. At the height of the gold rush, Nome had more than 20,000 residents, making it the largest city in Alaska. Even Wyatt Earp owned and operated a saloon there from 1899 to 1901. As the representative of a syndicate of American investors, Treve Gibson used his mining experience in Montana and British Columbia to explore goldfields far from the coast in Alaska. After an early voyage from Seattle to the Aleutian Islands, Gibson’s ship was delayed by ice. After a week in port and nearly two weeks trapped in the Bering Sea, an ice-cutter made a path for the stranded ship, and Gibson arrived at Nome nearly in June, 1900, a month after he had planned. He was one of 18,000 people arriving that month. To examine another prospective goldfield, he departed from St. Michael on the west coast, travelling by steamer 400 miles up the Yukon River. After another 250 miles up the Koyukuk River, the steamer could go no further because of low water, and Gibson and his companion canoed the remaining 300 miles. Finding the field too poor for his syndicate to mine profitably, Gibson returned downriver by dugout canoe, and caught a passing steamer back to St. Michael. Along the way, he witnessed the devastation of the influenza and measles epidemic on the native population and buried an Athapaskan Indian chief. Gibson’s memoir ends with his return to Nome, where he spent the next dozen years supervising the mining of millions of dollars of gold. Treve M. Gibson (1869-1958) was born in Hannibal, Missouri. In the 1880s, Gibson was involved in copper mining near Butte, Montana. Gibson then became involved with silver and lead mines in southeastern British Columbia. In 1889, he was living in the Washington Territory, when the governor of Kentucky deputized him to search for and arrest Johnse Hatfield for the murder of Alifair McCoy in January 1888, a brutal episode in the longstanding Hatfield-McCoy feud. Gibson married Elizabeth M. Roberts (1873-1930), on December 22, 1896, in Los Angeles, California. In 1897, their son Edward was born in British Columbia. In 1900, their son Frederick was born in California, while his father was away on the trip chronicled in this memoir. From 1901 to 1912, the family lived in Nome, Alaska, where Treve Gibson supervised gold mining. After losing several claims in lawsuits, Gibson moved his family in 1912 to Oakland, California, where he sold Chevrolet automobiles for a time and then became involved in paving materials in 1915. Later Gibson and his wife adopted a daughter, Helen, who was born in Alaska in 1917, but her mother died in giving birth. After more business pursuits including a service station and a gold mine in Arizona, Gibson suffered a serious fall that left him partly disabled. Treve Gibson died in Los Angeles, still dreaming of re-locating a uranium deposit he had seen in Idaho in 1899, to pass on a fortune to his heirs. As the nineteenth century came to a close, reports brought down from Alaska indicated that immensely rich placer gold fields had been discovered on the frozen shores of the Bering sea, and in the streams draining the hinterland. These stories had received official confirmation by the publication of a brief report by the U.S. Geological Survey. There quickly followed a stampede of thousands upon thousands of people, to the scene of the reported strike. Most of these <2> people embarked upon their long journey from the port of Seattle. Every available ship, on the Pacific coast, was drawn into this service and yet many were unable to get passage on the first sailing. It was well known that the greater part of Bering Sea was covered with ice in winter, but with the beginning of summer, this ice softens, breaks up, and flows through Bering straits into the Arctic. No news from up there being possible the fleet was held at Seattle until its masters felt it was reasonably safe to enter Bering Sea. They fixed the sailing date, at, about, the 1st of June. My part, in this great stampede came about in the following manner, and if you follow to the end of the story you will learn that I had many strange experiences, that could not have happened elsewhere, nor ever, again anywhere. A Syndicate backed with ample capital to carry on, in a large way, in the new <3> mining field, had decided to send an expedition up there, under the capable management of a well know Engineer. This Engineer, who I shall call Mr. Matson, for the purposes of this story, selected ten men from among his acquaintances, to go with him. I was among the ten, and since I had had rather wide experience in the work we were to do, Mr Matson made me first Assistant in the field, with extensive powers and responsibilities, so far as concerned buying, leasing or locating mining claims, and otherwise conducting the business of the Syndicate. The Matson party arrived in Seattle, about the middle of April, and at once set about to buy such merchandise and equipment, as we concieved would best meet our needs in a cold and desolate country. It was believed that for a concern having our objectives <4> it would be greatly to our advantage to reach the new field ahead of the big crowd. Accordingly, we secured transportation on the best ship, at some extra cost, although we knew that the ace in Bering sea, was to a large extend the controlling factor. Keeping a close tab on waterfront news we learned that while none of the big ships would sail before the 1st of June, a small vessel called the Dora, which had formerly been a U.S. Revenue Cutter, but now belonged to the Alaska Commercial Co. would sail from Seattle on May 1st calling at several Company Trading Posts with supplies and mail, but with Nome, the new goldfield town, as her destination. The Dora had accommodations for thirty first class passengers. We were unable to obtain but one ticket. The Dora was a wooden boat, with fifteen feet of solid ironwood built into her bow. She could be driven fullsteam ahead, into an icefield without damage to the ship. We expected her to reach Nome many days ahead of the main <5> fleet. Mr Matson decided that I should use the Dora ticket, and do everything possible to further our interests, upon my arrival at Nome. The time having arrived I said goodby to our party the little Dora steamed out through the straits of Fuca into the rough Pacific. Our first stop was at Kodiak, in the extreme north end of the Pacific, which we reached on the eleventh day out of Seattle. The village of Kodiak is built on an Island having the same name, and has a beautiful land locked harbor. The natives are called Aluets [sic] and are largely a mixture of Russian and Indian blood. They are not so brown as the full blood indian nor yet so fair as the white Russians from whom they have descended. At the time of our visit there were about six hundred residents on the island, only a few of whom were <6> white. They are friendly and hospitable and fond of music and dancing. Learning that the Dora party would stay over till the following day, the Villagers arranged for a dance to be held that evening, to which every one was invited. Their school house was crowded with revellers. Kodiak Island is about one hundred miles long and twenty five miles wide. It consists of rolling hills covered with evergreen timber and is beautiful to look upon. Its streams are teeming with fish and its forests abound in wild game. It was upon this Island that the explorer Vitus Behring built his rock monument and set up the Russian Flag, claiming the whole of the territory of Alaska for Peter the Great, Czar of Russia. About one hundred years later our government bought the title for $7,000,000 cash. Having delivered our mail and supplies and after about a 24 hour stay, we said goodby to this <7> beautiful Island and set our course for the Unimak Pass, which lies about three hundred miles south and west of Kodiak. This Pass is the entrance to Bering Sea from the Pacific, and is a wide channel through the Alaska Archipelago, which extends from the main land near Kodiak about six hundred miles down toward Japan. This Archipelago is a chain of volcanic mountains many of which are still active. When viewed from a ship at sea, it is a grand and impressive sight to see great columns of fire rising one hundred to three hundred feet above the peaks. One large area is called, “The land of a thousand smokes” because of the great number of fumeroles through which gas and smoke hisses continuously. Earthquakes are of frequent occurrence and islands <8> have disappeared beneath the sea following a cataclysmic readjustment after a great outpouring of lava. Shortly after the Dora made her trip down along that Coast, and explosive outburst from the Katmai Volcano, caused two islands to sink, leaving only a floating mass of brush and other vegetation to mark where they had been. Had this happened while the Dora was in these waters, nothing could have saved us from Davy Jone’s Locker. When we reached Unalaska, we were told, that the winter had been exceptionally cold and the soft, spring weather late in coming. In all probability the greater part of Bering sea was still covered with ice, though none could be seen from high points of observation on Unimak Island. Captain Thomas was reluctant to proceed until weather conditions became <9> more favorable, though strongly urged by his passengers to do so. To ease the tension, he proposed a fishing party on the codfish banks about sixty miles north of Unimak. Everybody who wanted to fish was given a line and hook and bait, the latter being one inch cubes of fat pork. We reached the banks without encountering any ice, but we could see it to the north of us, stretching endlessly in great, rough, snowy hummocks (?). The fishing party was very successful. We would lower our weighted lines over the side of the ship holding the line in our hands. When the hook and bait had sunk about one hundred feet the exciting moment had arrived. At once a great tug would be felt on the line and the fight was on. <10> It took about five minutes to gentle him down, so he could be hauled to the surface. He would weigh from fifteen to twenty five pounds, and his meat was snow white, firm and rich. I know of no saltwater fish that is better eating. There must have been millions of them on the banks. The bait was no sooner down to their zone, than one of them snapped it up. In less than an hour we had all the fish aboard the ship that we felt we could beneficially use. Feeling quite happy over the outcome of the fishing expedition we steamed back to Unalaska. The Dora’s head chef was an expert in the preparation of fish for the table. We had broiled fish, baked fish, fried fish, tongues and sounds, and other preparations, all of which drew praise from the passengers. After four days of restless waiting, Captain Thomas proposed another outing. This time we went clam digging. The Captain ran the Dora around to the north side of Unimak Island <11> a trip of about fifteen miles, and here along the shore we gathered about three bushels of big, fat, juicy clams. I think it is safe to say, that these cold water clams will rank in richness and flavor with the best found in the world. Again our chef outdid himself in the many different ways he served these clams. I am fond of clams but my clam eating is history. I know I shall never again experience a two day clam eating period, when they will taste as good as they did that time on the Dora. After more than a week of continuously mild weather, Captain Thomas decided to head for the Prybolof [Pribilof] Islands, which lie about one hundred miles north of Unimak. These Islands are the breeding grounds for the Alaska fur seal and belong to the United States. The Alaska Commercial Co. at that time had a <12> lease from the government covering these islands, and had the exclusive right to take and market fur seal skins. The Company had a working plant and maintained a sufficient force of men on the islands to take one hundred thousand skins per season. The Dora carried mail and supplies for this station. We reached the Islands without encountering ice, which was evidence that the icefields had moved northward since we had seen it from the Codfish banks. Our stay at the islands was brief and the passengers were not allowed to go ashore. From the ships deck, however, we got a good view of the land surface and thousands of seals could be seen flopping themselves about over the land, using their flippers and tail as a substitute for legs. A mighty din of noise reached us from the seal herd, ranging in tone from the horse billow of a bull to the cry of a baby seal, which is very <13> like the cry of a human baby. It was said the herd numbered nearly one million animals. Having finished with our call at the islands, we laid our course for Nome on the last lap of the trip. About thirty miles north of the islands we came to the edge of the icefields. As far as we could see in all directions, except the way we had come, the ice was continuous. Immediately ahead of us, there were long, narrow strips of water leading into the icefield. After some hesitation, the Captain headed the Dora into one of these and followed it to its northern end, about five miles. Slightly to the east of us another of these long leads northward could be seen, but we were separated from it by an istmus [sic: isthmus] of ice about one hundred feet across. The Captain placed the <14> ship as far away from the istmus as the open water would permit and plunged at it, with all the speed the ship could develope. She drove about half her length into the ice and came to a dead stop. This operation was repeated three times, hitting into the same notch each time, and on the third trial, she ploughed through into the next lead. We followed this northward about five miles and came to a blind end. No open lead could be seen within reasonable distance, and the Captain decided to tie to the ice and wait for a change, as it was evident the whole field was shifting. Within a few hours a severe blizzard swept down from the north, across the icefield. The weather became intensely cold and new ice formed on the water around the ship. The blizzard continued for three days and nights and the temperature fell <15> to zero. The new ice became a foot thick and the ship was completely sealed in. The floe ice, although many feet thick, was of a spongy nature due in part to the intermixture of snow and in part to the crunching together and overlapping of separate floes, before the whole surface became a solid mass of ice. The new ice was close grained, clear ice and would melt very slowly. It was impossible to move the ship in any direction. We speculated on the possibilities of escape, but always reached one conclusion, which was, that we would be carried through the straits into the Arctic, with the icefield. In such event, there was great danger of the ship being crushed in splinters, in the jamb of ice at the <16> narrowing neck of the straits. After the blizzard had blown by, and the weather became normal for June weather in that latitude, some of us ventured out on the ice, walking as much as two or three miles away from the ship. We saw many hair seals and a few walrus, sporting near air holes in the ice. Sometimes, we got quite close to them before they became alarmed and scuttled down under the ice. Some of our passengers asserted that seal meat was a table delicacy. Not the blubber, or layer of fat immediately under the skin, which is a staple diet among the Esquimos, but the red meat under the blubber. Some of us had rifles in our outfits and these were brought out, and a hunting expedition set out. We shot a seal, not far from the ship and dragged it in. It was about five feet long and a foot in diameter. When the skin and blubber had been removed, the body was <17> not much bigger than a good sized cat. The meat was a deep red color. It was prepared and served on the table, in several different ways, but thereafter all enthusiasm for seal meat died out in our crowd, and no more seals were brought in. Being confined to the ship and walking distance on the ice around it, passengers had time to become well acquainted, and congenial spirits became more or less confidential with each other, as to their hopes and aspirations in the new field. I had become quite friendly with a Mr Brown, of Boston. Mr Brown was not going to Nome, as most of us were, but far back into the interior at the headwaters of the Koyukuk river, a tributary of the Yukon, flowing from the Arctic Divide, and emptying into the Yukon about four hundred miles <18> from its mouth. Mr Brown was the Secretary of a Corporation, which had been organized in Boston three years earlier, with a subscribed capital of one hundred thousand dollars. This comany [sic] had sent a party of thirty men to explore and prospect for gold in Alaska. These men were under a leader chosen by the Company, and all were to share in the profits arising from the venture. Those who went out on the expedition contributed their labor for their share and those who remained at home, paid in, the cash capital. The expedition spent its first season at Dutch Harbor and Unalaska where they constructed a small steamboat for transportation on the Yukon river. Late in the season they had this steamboat towed over to the mouth of the Yukon, and wintered there. As soon as the ice was out of the river the following spring, they headed upstream. Arriving at <19> Nulatto, near the mouth of the Koyukuk, they learned that a promising gold find had, recently, been made on the Koyukuk, near the Arctic Circle. Several other steamboat expeditions had gathered at the Nulatto on the strength of this rumor, and presently all of them headed up the Koyukuk for this new strike. The new field was a disappointment although they spent the whole season and wintered there. The following summer a new strike was reported about one hundred and fifty miles further upstream. They were already at the head of navigation on the river. The new strike must be reached by canoes, or rowboats or on foot. Everybody went, and this time they really had gold. This was the find reported by [Alfred H.] Brooks and [Frank C.] Schrader <20> of the Geological Survey, to be yielding one hundred and twenty five dollars per man per day. The Boston party had located thirty one, twenty acre claims in the new district, and they decided that they had already worked long enough on the grubstake arrangement with their eastern friends. They declared the deal at an end, and announced their intention to hold the claims as located in their individual names and each for his own sole benefit. This situation was what brought Secretary Brown to Alaska. He had power and authority to call upon the state, if necessary, to enforce specific performance of the contracts entered into by these recalcitrant members of the company. Brown said he would sell all their holdings as soon as possible and wind up the mining venture. This was the point at which I became deeply interested. If upon examination, it appeared to be all that it was represented to <21> be my company would buy it at a reasonable valuation for cash. The upshot of this was that I agreed to go to the headwaters of the Koyukuk with Brown, if we got out of the icepack alive. As we neared the line of ice and open water, we saw many herds of walrus and hair seals. Ahead of us, on a separate floe about an acre in area, we could see several walrus. I brought out my rifle and when the ship was within easy range, I shot a big bull walrus. I pumped three shots into him, in rapid succession, and it was very evident that he was done for. The Captain stopped the ship and with block and tackle lifted the animal to the deck. He was an unusually large one. It was estimated that he would weigh at least sixteen hundred pounds. The Captain said, that since the winter had been very severe, the natives at Nome might be short of food, and this big walrus would be much appreciated by them. We dropped <24> anchor in the Nome roadstead that same evening, and the Captain sent word to the Esquimo village to come and get him. However, one of our passengers, an exMayor of Seattle preempted the head for mounting. The ivory tusks were as big and as long as a man’s arm. I would have been glad to own that mounted head myself, but I could see no way to take care of it, in view of what I had, immediately before me to do. Upon laying before Mr Matson such information as I had concerning the possibilities of Mr Brown’s Koyukuk property he agreed with me that it was worth investigating, and advised starting at soon as possible. It is something more than a thousand miles from Nome to the Koyukuk diggings, and only the most rugged physique, backed by tenacity of purpose could sustain a man, making that trip in those days. If I had known how difficult the trip would be, I wouldn’t have gone. Brown and I caught a boat from Nome to St. Michael, the next day after reaching Nome. The Alaska Commercial Co. had a fur trading station known as Bettles at the head of navigation on the Koyukuk. The river is only navigable that far up, in flood time, when the <26> snow is melting in June. The Company had, for several years, sent a boat up to Bettles in the latter part of June, to carry in trading supplies and bring out the accumulated store of furs. This was the only chance for transportation beyond points on the Yukon. Brown and I secured tickets on this boat, and knowing the gold fields were one hundred and fifty miles further upstream, we bought a good canoe, to carry us and our outfit from the end of the steamer run. After two weeks of waiting, they told us they had intended sending their light draft, steamer City of Paris but she had been delayed in delivering a cargo up the Innoko river and they had decided to send the Bella Union <27> to Bettles. She would leave that evening in time to catch the high tide over the Yukon mudflats. Brown and I hurried our stuff to the water front. We had already paid one hundred dollars each for our tickets and we were told at the start that the freight would be one hundred dollars a ton. We had only about a half ton of supplies and high freight on that, didn’t seem so bad, but when we brought our canoe around, they said they reserved the right to take freight by weight or measurement, at the ship’s option, and as our canoe measured one hundred cubic feet it was equivalent to five tons. The freight charges would be five hundred dollars. In vain we argued that two men could carry the canoe and that we actually had carried <28> it onto the dock. They said, “take it or leave it. We are too busy to argue.” We took it. We had to have it. The Yukon river spreads over mudflats eight miles wide as it enters Bering sea. The channels over these flats are continually shifting and they wind in serpentine courses, making navigation very difficult. Quite a number of Esquimos around the mouth of the Yukon seem to have a wizard-like ability to judge the depth of the muddy water by the bubbles, foam and debris floating on the surface. Every company boat going over the mudflats, has at least one and may have two or three of these native pilots who glue their eyes to the water and direct the steersman on his meandering course. If the tide is in, the situation is not so difficult, but at low tide, only very shallow draft boats can cross the flats. The best and most dependable channel is known as the Aphoon mouth. The Aphoon mouth <29> winds its crooked way through this vast sedimentary deposit along its north edge. When we left St Michael we were supposed to reach the mudflats in four hours, and this gave us the benefit of the high tide. It was soon discovered that the boat had leaky boilers. Our speed was reduced, and we were six hours on the way. In these two extra hours the tide had receded, and at one of the sharp turns in the channel the boat jammed onto a mud bar and stuck. All efforts to back off failed. Since there would not be another high tide for six days the Captain decided to lighten the ship by unloading cargo, until she could be floated. We were a half mile from shore and the only available means for lightening merchandise <30> was with row boats. It took four days to land one hundred and fifty tons, float the boat back into the channel and reload. We made the rest of the way through the mudflats without mishap but our delays were not yet over. On a slough near the mouth of the river the Company maintains a repair shop to take care of their river boats. Into this slough the the [sic] Bella Union was headed to repair her leaky boilers. This work required another five days, after which we steamed up the Yukon four hundred miles and entered the mouth of the Koyukuk at the end of the first week in July. The Koyukuk is a large river in its lower reaches but after covering about two hundred and fifty miles and passing the mouths of several large tributaries the volume of water was very noticeably decreased and it became evident that as two hours delay had cost us the benefit of the high tide over the mudflats, the subsequent delays had cost us the flood tide of the river. As, on most rivers, there were stretches of swift flowing, rifly water, between <31> stretches of deeper water. Our canoe was dropped into the water and our outfit, which weighed about a thousand pounds, was loaded into it. When all was ready, the Bella Union gave us a farewell whistle and steamed off down the river. We realized that we were a long way from civilization, and that no matter what happened, we had to rely solely upon our own resources. There was not even a remote chance that anybody would be going either up or down that river during the balance of the season, unless the hopeful wishes of the Bella Union Captain, about the City of Paris, were realized, and this we doubted. We were not at all worried and felt we could cope with any situation likely to arise. Our canoe was a good one. It was seventeen feet long and of four foot beam. It had row locks and a pair of good oars. It also had a sail and two good canoe paddles. The <33> half ton outfit served to stead it in the water, and it felt very substantial and safe. We started out taking turns at rowing and when we had a favorable breeze, we put up our sail. The weather had been clear and balmy all the time we were at St Michael and up to the time we left the Bella Union, but now heavy clouds filled the sky. On the afternoon of our second day in the canoe rain began to fall. It fell in sheets and torrents. We hurriedly went ashore, but before we could set up our tent, we were soaking wet. We staid in that camp until the following morning and although there was a drizzling rain falling, we again pushed on. Brown had caught a severe cold and as the day wore on he complained of pains in his stomach. His condition became so serious by midafternoon <34> that we again made camp. We had quite a variety of medicines in our kit, and I gave him such as he thought might help him. He grew steadily worse and by midnight he was raving in agony. I heated some water, and applied hot towels to his stomach. This gave him some relief, and I kept at it until midafternoon of the next day. He was in a high fever and part of the time his mind was wandering. In a lucid interval, he asked me to gather a tablespoonful of fir balsam, from small trees nearby, and he would take that as a dose of medicine. Within a few minutes, I had punctured several big blisters on the bark of these trees and obtained a tablespoonful of the balsam. He swallowed this with some effort, while I continued to apply the hot towels. About two hours after he swallowed the balsam, his skin broke out in red blotches over his entire body. These blotches were more or less circular in shape and a quarter of an inch in diameter. They covered <35> approximately half of the surface of his body. Immediately following the breaking out, his pain began to be assuaged, and within a couple of hours had ceased. His strength had all been sapped by the severity of the attack. He was unable to rise from the bed. I told him it would be best to head our canoe down stream, make the Yukon as fast as possible and catch a steamboat down the river. He opposed this with all the strength he had. He assured me that three or four days of rest in the camp would fix him alright and we could proceed with our trip. We staid in that camp five days. Brown was still too weak to row the canoe, but he had recovered his hopeful spirit and thought he would <36> at least, be able to sit in the stern of the canoe, and steer with a paddle while I edged it along toward the end of our journey. Where the water was deep and the current slow I rowed. Occasionally on these stretches, we would have a fair wind and I would hoist the sail. On the riffle water I towed it with a long tow line. Frequently, I waded in knee deep water to avoid brush and rocky shore lines. The work was terribly hard and I covered three hundred miles of it. We seldom made more than ten miles a day. We had been pulling upstream fifteen days. The only break in the vast silences of the unpeopled hills, was the occasional cry of the walloon [common loon] from the distant swamps, the quack of ducks which flitted up and down the stream and the sight of a bear fishing along the shore. One bright afternoon, as we rounded a bend in the river, there loomed up <37> before us, a fair sized town. We had never heard of this town and could hardly believe our eyes. We landed in front of the place, and stood looking up the gentle slope, at more than a score of buildings, mostly one story but some two stories high. They were made of lodgepole pine logs. The bark had been shaved off, the logs neatly notched together and the crooks were chinked with green moss. There was a row of ten buildings set to a line and facing a street. A six-foot plank sidewalk ran the full length of the row of buildings. The buildings were stores of about the regulation size for small towns. Many other buildings were scattered about but these were mostly smaller than the stores group. We advanced into the city. Some distance from the river and near the building <38> area, an arch bent over the approach and on this arch were the words “Arctic City.” Approaching the nearest store building we knocked on the door, and then tried the knob. The door was not locked. Looking in, we saw that it was, indeed, a store, and apparently well stocked with merchandise. We then went from door to door along the row of stores. All were unlocked and all were stocked with merchandise. Some had clothing and shoes. Some had furniture. Some had household goods, including blankets pillows and mattresses. Most of them had food. We went everywhere throughout the town calling, hello, but there was not a living soul in the place, and there hadn’t been since the year before. This was the place from which every last citizen had stampeded to the new goldfield, for which Brown and I were heading, and Brown’s party had been among those who built <39> Arctic City. The distance to the new strike was so great, and the means of transportation so meager, that no one attempted to take anything with him but the bare necessities of life. Most of the merchandise in that city was safe from marauders, although unguarded, because, freight charges to any market in which it could be sold would be higher than the selling price of the merchandise. Of course, not all of this merchandise had been taken in there by the front rank prospecting expeditions, like the Brown party. They had cargos of canned food, bacon, ham, flour, sugar, beans and other necessary staple food together with work clothes, raincoats, rubber boots and the like. Some of them also had various kinds of mining machinery, including a portable saw mill. One of them had an electric lighting <40> plant, with all necessary material to make beneficial use of it. This had been set up, and not only were all stores and other buildings electric lighted, but the main street and other principal spots in the building area were also lighted. The saw mill had made the lumber for floors and other inside finishs of their pine log buildings. Following the great gold discovery at Dawson and the rush of people to that district, over the almost impassable coast range, through the Chilcoot and other passes, to the Yukon valley, a rich and profitable market had been created for useful merchandise. The high road to this settlement was through the Bering Sea and up the eighteen hundred mile stretch of the Yukon river. Our people, like the Phoenicians and merchants of Venice sent out Argosies of merchandise on Venture. <41> This merchandise consisting of everything useful to man and in many instances these ventures proved very profitable. In our case, a Seattle man shipped a cargo of hay. It was well known that there were comparatively few horses and no cattle or other live stock at Dawson. The wise traders shipped only merchandise suited for man’s consumption. As a result this one shipper owned all the hay in Dawson as winter closed in. The pack trains carrying supplies out to the various mining operators must have hay for their mules and horses. They bought this hay at such fabulous prices that the profits launched the Seattle and Yukon Transportation and Trading Co. the following season, with five river steamboats and a string of trading <42> stations along the Yukon. Some of these trading expeditions found their way into Arctic City and cast their lot with the pioneers already there. This accounted for the great variety of merchandise in this small, new town. This Arctic City case, is an outstanding example of the folly of building substantial improvements on mines before they are developed. Because they could pan fine gold from the surface of a sand bar in the river, they thought the bottom gravel, would necessarily be rich in corse gold. The great volume of water in the river prevented them from sinking to the bedrock with the equipment they had. They knew they could sink in the winter, when the water would be very low and the extremely cold weather would freeze the walls of their shafts and make them stand without timbering. They turned their attention to building a town and having time and material <43> they wanted a town that would be a credit to the builders. The winter prospecting proved that the only gold they had, was the fine gold on top. When spring came and somebody came in from up the river, with a poke full of real nuggets, they stood not on the order of going but went. Brown and I reached Bettles in our next move from Arctic City. The most interesting sight we saw there was, the station’s fur storeroom. This was a log building about thirty feet wide and one hundred feet long. It was two stories high but all in one barnlike structure. Trappers bring their furs in there from a radius of five hundred miles. Every fur known to Alaska, may be found in that storeroom, and if you want to buy a few nice ones, the price will be so much less, than that to which you are accustomed, you will almost doubt that they are genuine. Much of this trapping is done by natives who live in small, scattered villages in the hill country bordering the main river basin. These natives differ from the Esquimos who live along the coast <45> of Bering sea and the Arctic Ocean. They are taller and their eyes have but little Oriental slant. They are more nearly like the North American Indian with whom we are all familiar. They have no permanent villages along the main river but during the salmon run season in August and September, many temporary villages are established on the river banks and great quantities of salmon are caught. They split these into strips, lengthwise, and hang them on a line to dry, in the open air. These make a large part of their winter food, both for themselves and their wolf like dogs, of which they have many. I was disillusioned and much disappointed with the mines. The streams carrying the gold bearing gravel, were small, shallow <46> streams and did not offer yardage on which to base large scale operations. The gross value of the known workable area was so much below my expectations, that I told Brown, we would not buy it and I prepared for an immediate return to the Yukon. Brown said he would stay with the mines and make the best he could out of the situation. Finding I could buy a good indian, dugout, canoe, I left our canoe for Brown to get around in. I pulled out down the river alone. Going down the river was a <47> much easier matter than going up. There were stretches where the current along, would carry me nine miles an hour. When I got down as far as Arctic City, I was surprised to see a man walking town toward the landing. He was waving to me to come in. When I pulled up to the shore I saw that he had two quart bottles in his hands. He offered me these bottles, and said they contained as good moonshine corn whiskey any man ever drank. He and his prospector partner had landed there several days before and finding all the material needed, they had made a still and turned out many gallons of this drink. He didn’t want to see anybody going short of drink when he had so much of it and it was so easy to make more. He insisted that I take the two bottles and offered to bring a half <48> dozen more if I wanted them. I dont care much for corn whiskey but I thought it best to accept his two bottles and thank him for his generosity. I asked him how long he expected to remain there and he said their stay was wholly indefinite. They hadn’t even thought about leaving. He wanted me to stop over and enjoy their hospitality for a few days but I told him I was in a great hurry to reach the Yukon and took my leave. About one hundred miles below Arctic City, as I approached an indian camp a man stood on the bank waving frantically for me to come in. As I landed my canoe in front of their camp, a little girl about eight or nine years old, who could speak understandable English came out to the canoe and asked me if I had a white handkerchief. I didn’t have one, but told her I could give her a piece of white cloth which she could make into a handkerchief I gave her the white unmarked side of a flour sack which I had saved to use for a dishcloth She was greatly pleased with this and <49> I followed her into the camp to see what she would do with it. She attached it to a staff about three feet long, making a flag of it, and she then led the way about one hundred feet from the edge of the camp. Here a little log pen had been built, A shaped like a gabled roof, the top being about three feet high. The little girl attached the flag staff to this pen and let the white flag unfold to the breeze. Looking through the cracks between logs I saw the bodies of two children, a girl and a boy about five or six years old lying side by side in that, their last resting place. Like the Esquimos on the coast they bury their dead upon the surface and they had built the log structure to protect them from wild animals. The little girl was so pleased over mounting that white flag, my curiosity was greatly aroused. I asked her what good the flag would do. She said it would hail passing spirits to stop and take the spirits of these children with them to another world. She said the spirits would not stop to take on passengers unless they were flagged by a white flag. She told me that a great sickness prevailed among the natives on the lower river. That many had <50> died and were daily dying from this plague. It was an influenza and the victims of the attack usually died within three days after being stricken. They had no means of coping with such an epidemic and their villages were decimated by the violence of the attack. I was told at Nulatto that some of the villages had lost ninety per cent of the population. The United States government had sent a Yukon river patrol boat into the epidemic area with medical aid and supplies. A few miles down the river from where the white flag had been hoisted I was again hailed, and waved in to a native camp. The camp consisted of three small tents and only two people. A man and a woman could be seen as I approached. The woman, who was very old, sat in a crouched position by a camp fire, rocking her body to and fro, and uttering a kind of crooning sound. She paid no attention to me <51> She apparently didn’t even see me. The man, who was also quite old was roasting a duck, spitted on a long stick. Looking into one of the tents, which stood open I could see two men lying on a pallet. These men were suffering from the dreadful influenza and were so near complete collapse that they unable to clear their lips and faces of the sputum that they had coughed up. I asked the old man at the fire what I could do for them. He pointed to a fur robe spread upon the ground a few feet from the camp fire and said: “Last night, he die. You bury. He chief. You bury in box like white man. This bank overflow. Otherside high bank in timber. Bury there.” He pointed to a rather large rowboat on the bank near the river and said: “Take lumber from boat. Make box.” This was one of the most gruesome tasks of my life but their situation was so desperate I could not refuse to do it. I examined the boat and found that it was lined with one by six inch lumber which could be torn out. I asked him for tools, and all he had was a claw hammer and a hand saw which had been broken off near the middle. I had a miner’s pick and shovel and an ax in my outfit and with these tools I ripped the lining and flooring out of that boat and made a box that would answer for a coffin. I put the box in my canoe <52> and then laid the body of the chief in it. I said goodby to the camp and pushed off. The river at this point is about a quarter of a mile wide. The farther shore was a sharp cut bank about twenty feet high. By far the greater volume of the river hugged that side and the current was very swift. Using my best efforts with a paddle, my canoe drilled down stream more than a mile before I reached the high shore. Then I was confronted by the problem of finding a break in the bank that I could climb with the load I had. This bank consisted of a sandy loess that had been deposited by the river in ages gone by, and the current was not undercutting it and caving it down. Skirting the shore for some distance I presently came to a place where a slide of several successive blocks had made stepping stones and offered footing to reach the top. I landed my canoe, took my pick and shovel and climbed to the top. The area was thickly overgrown with lodgepole pines and it was not easy to find a clear area large enough to dig a grave. I found one presently and soon had a grave about thirty inches deep. At this depth I encountered frozen ground. This is the permanent frost that is common to all the Arctic region and you cannot pick your way through it. I knew it was useless to try to dig deeper and I called it finished. I went down to the canoe, lifted the body out of the box and laid it on the bank. I then worked the box up the bank little by little resting it on the broken blocks and finally landing it on top and into the grave. The body though not as heavy as the box was more difficult to handle. I finally got him up, by tieing a rope around his body close under his arms and pulling him up by stages to the most suitable landing places, and then climbing higher and pulling again. I laid him in the box and then brought up the lid and was not long in heaping the earth over him. I blazed a tree and wrote on it that I had buried an indian chief there, who had fallen a victim to the epidemic. <53> It was now midnight and I had been at my task since noon. The time of day made no difference in the light. It was daylight all the time in the Arctic regions. I was tired and needed rest but I could not bring myself to try to sleep in that neighborhood. I got into my canoe and pushed off downstream. The swift current and my paddle carried me twenty five miles in the next two hours. I ran ashore on a gravel bar and spread my bed on the ground. As I went to sleep the sun of another day was looming high over the northeastern horizon leaving the troubles and heartaches of yesterday among the things of the past. Before I reached the Yukon I was hailed into several more indian camps in all of which their distress was pitiful to see. I could give very little help though they seemed to think that a white man should be able to drive away the demon that was devouring them. <54> I gave them bits of tea, and salt and sugar from my supplies but they were really not short of food, of the kind to which they were accustomed. When I reached the Yukon, the government river patrol boat was at Nulatto on its way into the Koyukuk to give help to the stricken natives. I told the Captain of this boat what I had seen of their distress and he left at once to give them assistance. The whole Koyukuk trip both up and down had been more or less of a nightmare to me and I was glad to leave it behind me. I was firmly resolved that no matter what rich discoveries might thereafter be made in the Koyukuk basin, I, for one, would not join the stampede to share in it. There were many boats plying the Yukon and I was soon on my way to St Michael I took my outfit with one but gave my canoe to a native at Nulatto. Arriving at St Michaels I found the first boat, booked for Nome would leave three days later. I secured passage on this boat and then put up at the Alaska Commercial Co’s <55> Hotel which was a rather pretentious hostelry for a place the size of St Michael. This was the general headquarters for some big companies operating Trading Stations along the Yukon and fleets of river steamers, as far as Dawson. Most of the high officials of the Alaska Commercial Co. were stationed here and made their homes in the Company hotel. Preparations were being made to add an annex at the back of the main building. The original building has abutted against a church yard about one acre in extent and in the middle of this stood an old fashioned church building now much dilapidated from age. The yard around this church was a cemetery for the faithful followers of the old Russian Priests who had established this church more than a century earlier. To build the Annex it was necessary to excavate a portion of this cemetery and here I saw a strange sight. The terrain is a part of the endless tundra of the Arctic and is permanently frozen. The bodies exhumed were in such a state of preservation as, to look as if <56> they had only been buried a few days. One was that of a Priest, and there were records in the church to show he had been buried ninety years. The coffin in which he laid was made of rough whipsawed lumber and the nails that held it together were hand forged. He looked calm and peaceful, after his long slumber and except for extreme paleness, he looked natural. The bodies were being laid in another part of the cemetery and unless the climate of that latitude changes they will respond to Gabriels trumpet in the same form they left this earth. Certain, it is, that the biblical injunction, “unto dust thou shalt return” can never apply to them. When I returned to Nome I found that the Matson’s party had been very active in that field. They had acquired several promising mining claims by purchase and had made several locations in outlying, unprospected districts. It had not been my intention to winter in there but Mr Matson prevailed upon me to take charge of the Nome operations and let him return to his financial backers and make preparation for more extended operations which he now contemplated. This was the beginning of thirteen years of mining activity in Seward Peninsula, during which <57> many million dollars worth of gold were mined under my supervision. “And Hiram sent in the navy, his servants, shipment, that had knowledge of the sea, with the servants of Solomon. And they came to Ophir and fetched from thence gold, four hundred and twenty talents and brought it to King Solomon. And the Queen of Sheba came to visit Solomon, with a great train, and very much gold. Now the weight of gold that came to Solomon, in one year, was six hundred, three score and six talents besides that which the traders brought and the traffic of the merchants. And King Solomon made two hundred bucklers of beaten gold. Six hundred shekels of gold went to one buckler. And he made three hundred shields of beaten gold; three pounds of gold went to one shield. Moreover, the king made a great throne of ivory and overlaid <59> it with finest gold. And all King Solomon’s drinking vessels were of gold, and all the vessels of the house of Lebanon were of pure gold. So King Solomon exceeded all the kings of the earth in riches and in wisdom. And all of the earth sought the presence of Solomon.” These words from the bible, show, that from the beginning of historical time gold has been held in high esteem The fact that the people of the United States now have stored in vaults in Kentucky twenty two thousand five hundred tons of gold, is ample evidence of the high esteem in which gold is held in this country, and like in the days of Solomon all the people of the earth seek our friendship. I Kings 9:27-28, 10:2, 14-18, 21, 23-24, American Standard Version (1901).